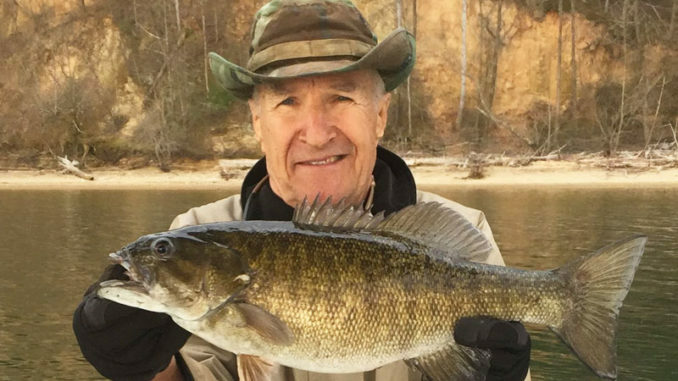 Big smallmouth bass are very active in April on North Carolina’s Lake James. 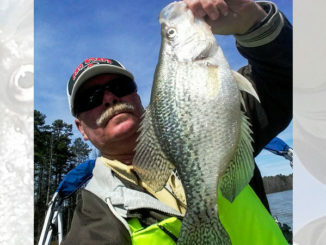 Muddy water has plagued fishermen this spring on many North Carolina reservoirs. And clear water will be a main issue at Lake James for smallmouth bass. Successful fishing for smallies requires switching depths and tactics based upon water clarity. Bass (www.coltbassfishing.com) said mornings are best for catching smallmouth in the shallows and on the surface. 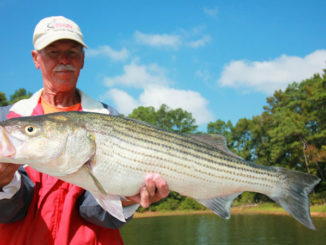 “I start every morning focusing on the surface bite down to 5 feet,” said Bass. He likes surface lures such as Flukes, jerkbaits and shallow-running crankbaits. The shallow bite is short-lived once the sun comes up. “Lake James is so clear that when the sun comes up, it’s time to go down to as much as 20 feet,” said Bass, who searches for smallmouth on humps, rock faces, old creek channels, long natural points and islands in 10 to 20 feet of water. Bass, who fishes live bait, spoons, Flukes and Shad Raps in natural colors, said smallmouths are ready to feed before they begin spawning. So he rarely fishes deeper than 20 feet because the instinct to spawn keeps fish shallow despite the clear water. April can be a breezy month, and Bass said the wind can be a critical factor as much as water color. Clear water also dictates his choice of tackle. To cast to breaking fish, he prefers spinning gear. Otherwise, Bass uses medium-light 7-foot baitcasting rods paired with Ambassadeur 6500 reels spooled with clear 10-pound line. 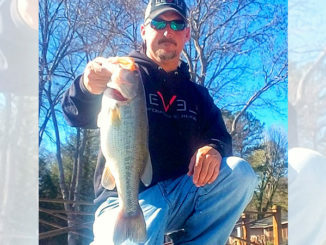 When he fishes live bait, usually shad, he switches to a Carolina rig with circle hooks. For his main line, he uses monofilament; for his leader, he uses fluorocarbon. Bass employs planer boards to position his baits away from the boat, which can frighten the fish in clear water. Most smallmouth at James weigh around 2 pounds, but every April a good number of 4-and 5-pound smallmouth come to the net amidst the stunning mountain scenery encasing the lake.